I found this interactive map interesting and was wondering how other states with WWB members fared? 29 beekeepers, in Kansas, with 2281 colonies, reported winter losses of 19.42%, for 2017-2018. 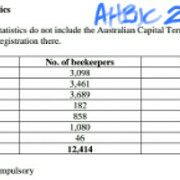 Of course, not all beekeepers contributed to the record keeping process. 29 beekeepers is only a fraction of the beekeepers in Kansas. 258 beekeepers responding in NC. We had a lot of "no-reason" losses. Plenty of bees, plenty of stores, just dead colonies. No explanation. Was that over all losses? Perhaps new, inexperienced beekeepers added to the high losses? I looked at Iowa for the last 11 years and the average winter loss reported over this time period was 47.59%. When I look at the last 5 years the average winter loss is 44.63% for those reporting. What I gather from this is that a lot of people kill a lot of bees each year. Which is good for the package bee sellers. I just clicked on the link to the map. I would guess it was the loss from those reporting. I will also point out that bee informed is not a free service so the data is likely for somewhat larger and newer operation. Secondly since they do this for pay their bias MAY BE overstate loss.... I am greatly impressed with the bee informed folks we have had here (they get a space at the bee lab) and the current one has been of great assistance to me in determining disease and laying out process and procedure for treatment (I do treat the bees at the lab but not my own). I do not treat my own bees but this does not mean I have a higher loss rate attributed to mites. I also do not use my bees for pollination services so the quantities of contamination from doing that is almost non existent... Add the two together, ie no contamination from ag chemicals and no contamination from beekeeper applied varroa treatment, and the end results is my loss from these factors fall more into the top of the chart than the bottom. and finally the 'loss' in these sorts of surveys have always left me scratching my head in that if I start the year out with 100 hives, split out 200 nucs and then lose 50 what exactly is my 'loss'? That was the question I was trying to ask. There can be losses because of many different reasons. Novice beekeepers are prone to many mistakes that can result in colony loss. A more experienced beekeeper and even a 2-3 year beekeeper will make splits and catch swarms. Some do their own queen rearing. Are those losses 5 frame nucs, 10 frame single brood boxes, or double brood boxes? Lots of variables. I guess it falls under what the beekeeper was anticipating as a viable colony. I think there is no doubt that experience play a big part in the numbers as does the uncontrollable variable of seasonal variation in nectar flow. How beekeepers use numbers for losses or for calculating average honey yield has always been something that leaves me scratching my head. And of course for some folks there is the added factor of insurance which might tempt folks to cheat just a bit....< some years ago (pre varroa) one of the biggest losses in beehives was due to fire up in the plain states and bees were covered by insurance if they perished by fire. Making reliable records about loss of bee hives is a difficult task. Much like putting your finger on a moving target with your shoes nailed to the floor and one eye covered. 'Voluntary participation' results in a serious, and probably insurmountable gap, (flaw if you will), in these data. task, and remember someone always sets to audit these things one day. anything, that alone at %ages quoted boggles the mind as to how folk keep going. Has to be tremendous stress on any beekeeper in my view. but touch wood and no VD nothing of the scale this report brings to the table.